End of the year is all about the transfer market and competition is fierce. Again, Palmeiras seem rather out of the loop, with players leaving but no one entering the squad. Left-winger Gabriel Silva is soon to join former Palmeiras players Danilo and Pablo Armero at Udinese, current top dogs in the Italian championship. The 20-year-old played a total of 58 games for Palmeiras in 2010/2011 and is of course looking forward to his transfer to Europe. “I wouldn’t have gone this far hadn’t it been for Palmeiras”, he says. “Ever since my junior years, I’ve always been treated with respect and care. The same happened in the A team. I owe my professional and personal growth to the club and I leave the door open in order to, who knows, one day again wear this jersey”. Pierre has been on loan to Atlético Mineiro most of the second half of 2011. The midfielder has been enjoying his time in Belo Horizonte and Atlético have been enjoying Pierre, considering him a fundamental piece in the club’s late recovery and subsequent escape from relegation. Pierre has made it clear: he’d like to stay at Atlético. His firm position is a little surprising considering that the Palmeiras jersey was considered Pierre’s “second skin”. My guess is that the “warrior”, as is his nickname, doesn’t go to well with Scolari. It makes me sad, but we can’t afford to have unmotivated players at Palmeiras. Hopefully a solutions is reached, and soon. Remember Ewerthon? The striker played 36 games for Palmeiras in 2010 before transferring to Russian club Terek Grozny. 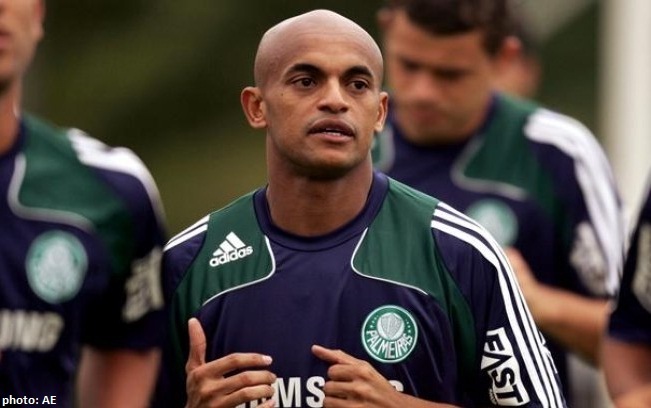 Palmeiras owe him money and had agreed on a payment plan with instalments starting in January of this year. The first instalment was paid but the three consecutive ones were neglected, propelling the U$ 300.000 debt into a U$ 600.000 monster. At Palmeiras, no one steps forward taking responsibility for the embarrassing episode that unfolded in a period when the management was busy cutting costs by getting rid of the club’s colour printers. Amateurs. More turbulence was generated earlier this month as football manager Cesar Sampaio felt the need to personally call up counsellor Gilto Avallone and explain to him that his salary was nowhere close to the U$ 37.000 Mr Avallone had been publicly complaining about. When Sampaio informed that his salary was roughly U$ 14.000, Mr Avallone replied “send me a copy of your pay check and I’ll take back what I said”. In a singular effort to hit the jackpot in the “game of shame”, on Wednesday a note appeared on Palmeiras’ official website in response to recent debate and manifestation for the Direct Vote (for president) and other substantially important statutory changes. The note, signed by no particular person but “the directors”, basically states that the management has never been opposed to discussing the Direct Vote, but that profound debate is needed before one changes a 97-year-old procedure. In addition, the note states that the manifestations only serve to bring confusion and havoc to a procedure that is internally being conducted in a transparent and democratic manner. It’s bad that the note contains misleading information and outright lies but even worse that directors are using Palmeiras’ official website as a weapon in the internal political battle for power. If they think they are scoring points this way – turning the clock back to the dark ages – wait and see the force of coming manifestations. Congratulations, vermin: the war just escalated to a new level.